Are 2016 Presidential Candidates Secretly Collecting Your Info? As the 2016 race to the White House heats up, one issue that is white hot is privacy. Specifically, how much privacy United States citizens are entitled to from their government. Does the government have the right to collect our information, such as phone records? Should a warrant be required to do so? What should be done with the USA Patriot Act (abolishment, reformation, or extension)? Such questions have been debated by former, current, and aspiring politicians with ferocity. So, how do the 2016 Presidential hopefuls feel about privacy? While many (if not all) of them have publicly voiced their opinion on the matter… we thought it would be fun to see if they are practicing what they preach, for lack of a better term. To find out, we used Tag Inspector to scan each Democratic and Republican candidate’s website. The goal being to discover what tags, if any, candidates are using to collect your information. When scanning a candidate’s website, two types of tags were looked for: Data aggregators and retargeting tags. This chart shows the total number of each data aggregator found on 2016 presidential candidate websites. 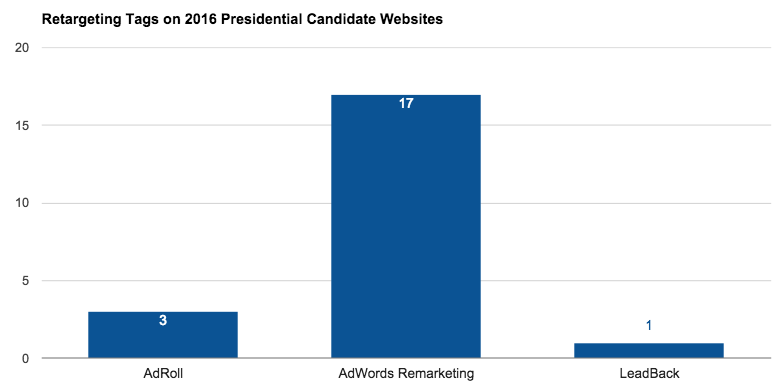 This chart shows the total number of each retargeting tag found on 2016 presidential candidate websites. The main difference between data aggregators and retargeting tags is that data aggregators are collecting information about you, storing that information (building a profile), and then using, sharing, or selling that “profile” so that a slew of companies, candidates, etc. can serve ads to you. Retargeting, on the other hand, is not building a profile on you and is limited to the products and services of the site you’re currently on (you’ll only see ads related to that site). To Summarize: Are the 2016 Presidential Candidates Collecting Info About You? Yes. Some are collecting information to retarget to you. Others are allowing aggregators to use their site to collect information about you. The chart below shows how many of the two different tag types are on each candidate’s website. This chart shows how many of each type of tag (data aggregators and retargeting tags) were found on each candidate’s website. 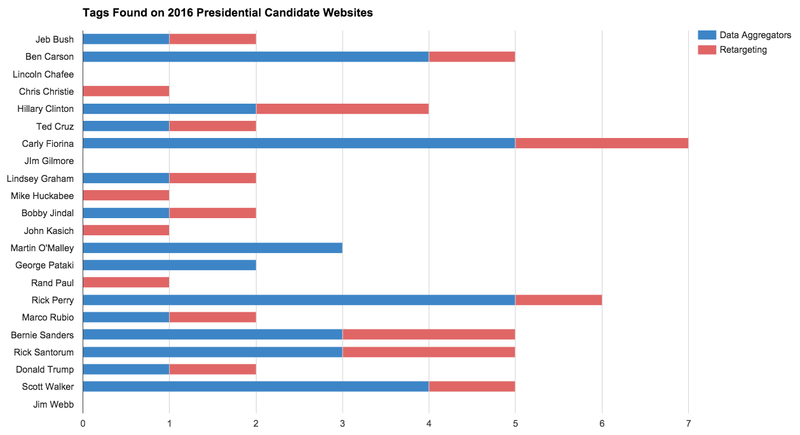 Here’s a detailed look at each candidate’s website. To see what the candidates have said in regards to the Patriot Act and privacy, read Where do the 2016 candidates stand on the Patriot Act and mass surveillance. BlueKai is a data aggregator, and it is one of the largest aggregators of consumer behavior in the country. When you visit a website in their network, they install a tracker on your computer that basically looks over your shoulder and tracks your activity (ex. what websites you visit). It assigns this behavior to you using a unique ID number. BlueKai then packages and shares or sells this data to other companies that basically profile you using over 30,000 different segments (ex. estimated household income). Then, when you visit websites that recognize your unique ID you see ads that are targeted to your profile. Chartbeat works a little differently than other data aggregators. It collects real-time information on how users are interacting with content. For example, you’ll often find Chartbeat on news sites so that the company can see how many individuals are on a specific article at any given time. Datalogix connects offline behavior with online behavior in a variety of ways. For example, when you go shopping and provide your ZIP code or email address at checkout, you are helping them to pair you up with online behavior. They also get information by partnering with other companies and through public records. Quantcast is a data aggregator that collects anonymous information such as when a browser loads its web beacon (cookie). They do not collect any personally identifiable information. However, Quantcast may share data with 3rd parties including “companies employed to support Quantcast”. Rapleaf is a data aggregator that compiles a vast range of information including political leanings, religious affiliations, and personally identifiable information (PII) such as your name and email address. Rapleaf claims that it does not distribute personally identifiable information; however, in 2010, the Wall Street Journal discovered that in some cases the data aggregator had shared PII. Specifically, they state the case of Mrs. Twombly who had her unique Facebook ID number shared with at least 12 separate companies. According to The Online Privacy Blog, Rapleaf got in hot water in the past for selling personal information to the Maine GOP for retargeting around the election. In addition, Rapleaf was kicked off of Facebook at one point for selling unique Facebook IDs to advertisers. Resonate collects data at two different levels: 1.) anonymous “browser-level” and 2.) through online interviews. Data collected by Resonate may be saved for a period of 10 years. A Google product, AdWords Remarketing allows you to serve ads to individuals who have visited your website or mobile app in the past. You can tailor these ads based on behavior such as certain products or services viewed or pages viewed. Again, the most common use case of this is serving ads to someone that added something to their cart but did not checkout. Like Adwords, LeadBack allows you to serve ads to individuals that have visited your site. These ads are displayed across various websites in their network. Tag Inspector is a tag auditing and alerting tool developed by InfoTrust engineers. Its intended purpose is to help clients monitor and troubleshoot the tags running on a website. For example, a client may use Tag Inspector to ensure Google Analytics is firing on all pages. To find out more about Tag Inspector, including how it can benefit your site, visit: https://taginspector.com/.